Almost every girl went through a phase of wearing bangs. Be it full, side-swept, or bangs as a result of your childhood play time spent with your mom’s scissors, we’ve all been through it. Today, bangs are seen as one of the chicest (and easiest!) ways to update your look. The trouble comes, however, when they grow far too long and you try to decide if you should pay someone to trim them or be a trooper and cut 'em yourself. The secret is in twisting the section of hair before cutting it all off, that way, you won’t get bangs that are too blunt. Clever! 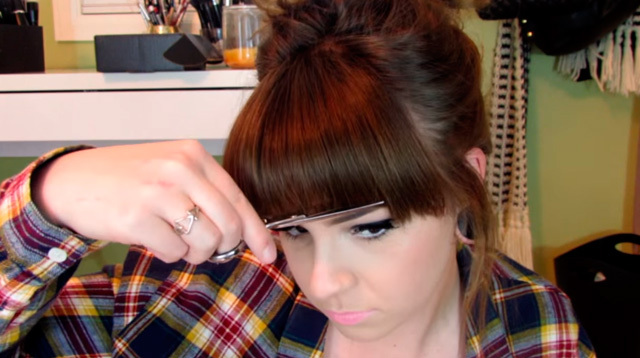 If you decide to try your hand at cutting your own bangs, remember Carly’s advice and start by cutting off a small section first—don’t go crazy!